Ended up having some great days on the water the last few days, thanks to some cold nights, cloudy skies, and better than average anglers in the boat. Everything seems to starting to roll on all 8 cylinders once again with the arrival of fall. 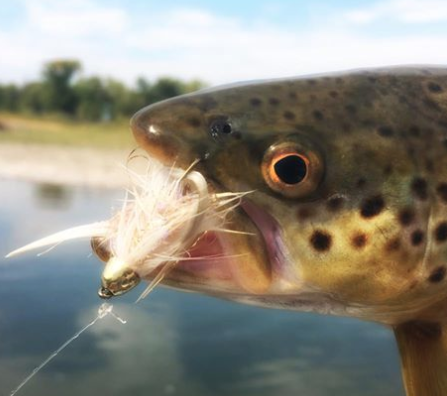 The lower Yellowstone has been solid on hoppers and rubber leg droppers, small bugs in the eddies under an indicator if you feel so inclined. Enough floating grass to make streamer fishing not so much fun, but doable. Seeing some Hecubas out too. Other places are all fishing well again too, so my life as a part-time fly fishing guide is getting much more easy than it had been the previous months. It was great to spend the days with some guys that have been part of my year for the last 13+ years on the water as well. To realize that we are getting older, but still doing what we love on the rivers that we love. Who knows how many times we have floated the waters of Southwest Montana together, yet I always end up being able to find something we have never done before. The Yellowstone just never gets old when it's fishing well. Although I think the "good ol' days are gone" the last few give me hope for some "not too bad of a day" ahead."